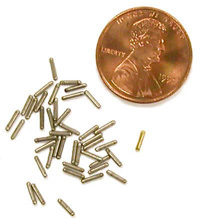 Prostate seed implantation (also known as “Prostate Brachytherapy”) involves treating the cancer by inserting radioactive sources (seeds) directly into the gland. Brachytherapy is an alternative method to traditional external beam radiation or surgery for men who have early stage prostate cancer (cancer that has not spread outside the prostate gland), but it is occasionally combined with external radiation. Iodine and palladium are two types of “isotopes” commonly used for seed implantation. Currently, they are generally considered to be equally effective treating prostate cancer. The seeds are temporarily radioactive and deliver radiation to the prostate over several weeks. After losing their radioactivity, the seeds remain in the prostate. The seeds are harmless and should not bother you. 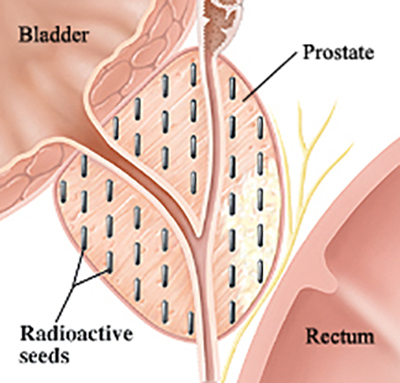 Radioactive seeds implanted throughout the prostate gland.